A Day of Paleo. A food lovers' project on Instagram. I get tons of questions to what it is I regularly eat, especially when people hear what 'foods' I don't eat. It gave me the idea to document a day in the life of a Paleolithean. (Is that a word? Google says 'no results', there's my good deed for today) I'd do this on Instagram and share to my Twitter and Facebook, under the #tag '#adayofpaleo', describing what it is people see. Simple, right? A quick introduction to us 'Paleolithians': We eat: Meat, Fish, Vegetables, Herbs, Fruits and Nuts. That's basically it. We don't eat: grains (this includes pasta), legumes, olive oil, potatoes, sugar, rice, soy and most things that have an EAN-Code on it. Simple concept. Breakfast: Black peppered bacon wrapped green asparagusses with egg. I started the day off with something simple, yet o-mazing. Grilled black peppered-green asparagus (speaking of weird words), wrapped in a coat of bacon with two eggs. They were prepared in Coconut oil, because it's simply the best stuff to cook anything in. And also, 7:30am. Just FYI. Checkout the original post here! Mise en place: dinner preparations. While the asparagusses are asperging it's time to make preparations for dinner. I use aCrock Pot for some meals, today was such a day. I had marinated four beautiful pieces of chuck roast. They got marinated in coffee grounds, Dutch cocoa, chipotle, cinnamon, oregano, cumin, garlic powder and salt. After marinating I seared them on each side for a few minutes before throwing them into the Crock Pot. But first I made sure there was a bed of sliced red oignons and shrooms for them to get comfortable on. I set the timer to switch on at noon-ish, 7 hours on 'low' does the trick. When I arrive home I know my senses will be met with the greatest of smells. Find the original recipe here and the Instagram post here. Lunch: Mustard infused burgers with fresh guaco and beetroot. Then there's my lunch. Typically my lunches are leftovers from dinner the day before. I eat these cold, even when they're meat or fish. I don't really care. Just as delicious. My dinner yesterday were mustard infused beef hamburgers, topped with a fresh spicy guaco and beetroots cooked with laurel. I used two eggs and a spoonful of cocoflour for consistency. A dash of salt, a dash of black pepper, spoonful of oregano and thyme mixed in and added bonus: red oignons. Half a kilo minced beef got me 4 burger patties. Find that original post here. A snack! 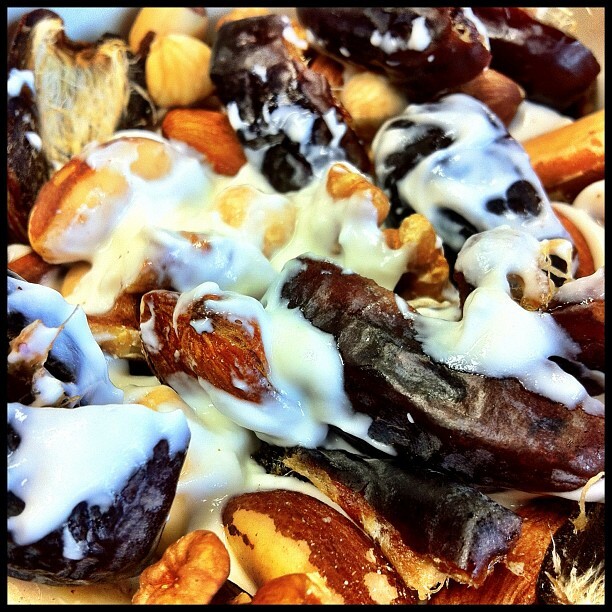 Greek yoghurt with dates and nuts! Title says it all. Greek Yoghurt (10%) with assorted nuts, (no peannuts, these are legumes) and a couple of dates thrown in there. I sometimes throw in Goji berries or cranberries too. Check out the original post here. Dinner: Spicy fried cauliflower rice with smokey chuck roast. When I got home the smokey roast was almost done; I've left myself some time to prepare a spicy cauliflower fried 'rice' to accompany the roast. This is also pretty easy, if you have a food processor. I inspired the 'rice' on this recipe, but I added a bit of sesame oil and curry spices. I also used a 'sweet' oignon for this, although I didn't really taste the difference. And the red oignons and shrooms from the crock-pot are exquisite. Original post here. Tagged with Paleo, Adayofpaleo, Food. July 19, 2012 by Emiel Sondag.